Heath Rose, Rikkyo University, Japan. This study examines students’ use of an English-only area designed as a drop-in centre for students to practice English. The study investigated whether students’ language ability, year of study or department of study influenced use of this facility. Data was collected through a log of student use of the area over a two-week period, and a survey given to 575 freshman students across three departments of study at the university (English, International Communication and Languages and Culture). The data showed no relationship between student language ability and feelings of satisfaction and comfort or desire to use the area. These results challenged the assumption that higher-level students used the area more often and were more comfortable and confident than lower-level students. In addition to collecting data on student use of and attitude toward the English-only area, interviews were also carried out with all 42 instructors who worked in the area at the time of data collection. The interviews with instructors indicated that ongoing speaking tasks during the first semester, like those used in the International Communication department, could encourage more frequent use of the English-only area, resulting in continued use of the area in later years. This study indicates that the creation and trial of lessons that encourage student use of this English-only area could be an area worthy of further research. The interviews with instructors also highlight a number of issues connected to self-access speaking areas that will help inform other institutions that are considering setting up similar facilities. In the field of Second Language Acquisition, a number of factors have been considered to affect students’ language learning. Some of these factors, such as motivation and self-directed learning, have been explored over the past few decades, and more recently research has turned to self-access learning. In order to promote self-directed learning, self-access centres (SACs) have been established in many educational institutions (Malcolm, 2004). Despite this development of SACs in recent years, there has been little research into the evaluation of student use of these centres (Morrison, 2005). This study, therefore, aims to address this lack of research, by examining student use of a self-access conversation facility at a language university. The study also investigates students’ desire to use the facility because “motivation is a key factor that influences the extent to which learners are ready to learn autonomously” (Spratt, Humphreys, & Chan, 2002, p. 245). The university in which the current study was conducted has placed a great deal of emphasis on the development of its students as autonomous learners, culminating in the opening of a SAC in 2003. According to Cooker and Torpey (2004), motivating students to use the SAC at this particular institution and motivating them to become autonomous learners has been a central objective of the English curriculum at this particular university, especially in the freshman year. In their paper, Cooker and Torpey (2004) discuss the university curricula and highlight the importance the university places “on fostering the capacity of our learners to become autonomous and on conveying to them the opportunities for self-directed learning” (p. 16). As part of its commitment to communicative language teaching and cross-cultural understanding, over forty native speakers of English were working as instructors in the university’s language institute at the time the study was conducted. As part of their teaching duties, these instructors were required to spend 3 hours each week in a conversation area – a lounge-like area adjacent to the SAC where students could drop in and speak to friends and instructors on duty in an English-only environment. It is important to clarify that although the conversation area was an official facility provided and operated by the language institute, rather than the SAC, it was indisputably a self-access learning facility. The conversation area was designed to assist in the development of the students’ communicative competence as a supplement to classroom activities. Savignon (1997) asserts that communication is “a continuous process of expression, interpretation, and negotiation of meaning” (p. 15). If a teacher participates in a conversation in the area, teacher input can be most helpful in focusing on sociolinguistic competence, as that particular competence is perhaps the most difficult for many speakers to improve through peer interaction. Sociolinguistic competence consists of understanding the appropriateness of language in context (Canale, 1983), and is “an interdisciplinary field of inquiry having to do with the social rules of language use” (Savignon, 1997, p. 41). Sociolinguistic competence involves skills such as knowing how to use language in different situations, and being sensitive to such factors as formality, register, style, and geographic or social language variation. Thus, the original rationale for the conversation area was that exposure to language in a cultural context would improve students’ communicative and sociolinguistic competence. It was also hoped that the area would encourage learner autonomy in the university. Dam (2003) outlines learner autonomy as a cumulative process which she summarises in “a learner’s four steps to learner responsibility” (p. 139): experience, awareness, influence, and responsibility. Experience with and insight into useful and relevant activities, suitable partners, appropriate ways of organizing the work undertaken, and various ways of evaluating process as well as progress. Awareness of what, why, and how to learn; awareness of one’s role in the learning process. Influence on and participation in decision making as regards one’s own learning (choice of activities, partners, materials, etc.). Responsibility for one’s own learning. Have I prepared the students enough for autonomous learning? Have I followed the four steps? Have I created a good environment for learning? The English-only speaking area addresses this final question—that is, while the curriculum of the university helped guide the students toward learner autonomy, the speaking area was intended to provide a good environment for them to practise and engage in learning language outside the curriculum. To investigate patterns of student use. To explore student attitudes towards the area. To explore teacher attitudes towards the area. Data were collected in three ways. Firstly, a logbook was implemented over a two-week period where all students who engaged in conversation with an instructor on duty were required to sign in and out, with information pertaining to their year of study, department, and class number. From this, their language ability could be ascertained due to classes being streamed according to a proficiency test. How comfortable do you feel visiting the English-only area? How clearly do you understand when teachers are on duty? How clearly do you understand which teachers are on duty? How clearly do you understand the purpose of the area and how to use it? Is there a teacher available at the time when you would like to use the area? How often do you use the area to talk with a teacher? Why do you use the area? How satisfied are you with the English-only area? Thirdly, all instructors who worked in the area were interviewed over a two-month period. Instructors were asked the following questions in semi-structured interview format. What do you enjoy most about your duty? What kinds of conversations do you like to have/ which topics do you like to discuss in the area? What do you find frustrating about your duty? Are there any topics students commonly bring up that you don’t like to or would rather not discuss? In what ways do you think the area is most useful to students? Do you encourage your students to use the area? If so, how and how often? Are the activities you encourage/assign useful in getting students to use the area? Do you have any suggestions for how any aspects of the area could be improved? Results from the logbook of student use of the speaking area over the two-week period revealed information on the type of students who visited this area. The results (summarized in Figure 1) indicated that freshman students made up the majority of students who used the area, comprising 54 percent of the total visits made during the two-week period. These results also showed a decrease in use of the English-only area with each subsequent year level, with fourth year students comprising just 3 percent of the visits made to the area in this period. Such results indicated that the English-only area was largely a freshman and sophomore-student domain. Figure 1. English-only area use according to students’ year of study. When the same data was analysed according to the language ability of the students in the freshman year, as indicated by performance of a proficiency exam, no relationship was found. That is, students from high proficiency classes used the area as often as students from the lower frequency classes. This challenged the assumptions of a previous study (Rose, 2007) that lower-level students may be less likely to use the English-only area than higher-level students due to nervousness, lack of confidence in ability, or shyness. When the data were split according to the department in which the student belonged, there was a large difference between the percentage score. International Communication (IC) majors comprised 50 percent of visits, compared to the English majors at 43 percent while Language & Culture (ILC) majors were 7 percent. When these figures were adjusted according to student numbers in each of the three departments, IC majors averaged 1.4 visits per freshman student in this two-week period, compared to 0.3 visits per student in the English and ILC Departments. These results indicate that on average an IC Department freshman student visited the English-only area five times more often than the average English department student. Later interviews with instructors revealed this might have been the result of a regular speaking assignment in the form of a speaking journal being given to all freshman students in this department. 550 surveys were collected from all freshman students across the three departments. The surveys asked eight questions regarding student use of the English-only area. With regard to the first question, in which students were asked how comfortable they felt in using the English-only area, less than half of the students indicated that they were comfortable about using the area. Figure 2. How comfortable students felt using the English-only area. Figure 2 shows these results divided according to the three departments. 67 (18 very and 49 somewhat) percent of IC department students stated they were comfortable in using the area, compared to 48 percent in the English department and 43 percent in the ILC Department. These results suggest a relationship between department and level of comfort. The sixth survey item investigated the frequency of visits students made to the English-only area. The results of the survey item are displayed in Figure 3. Figure 3. How often students used the English-only area. The vast majority of students (67 percent) visited the area less than 5 times throughout the semester. 26 percent visited once every one or two weeks. Seven percent visited more than once a week. When the same results were divided according to the three departments, considerable differences were discovered, as shown in Figure 4. Figure 4. 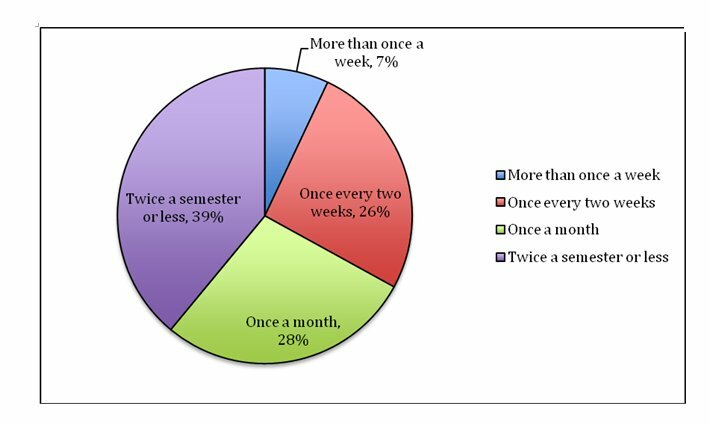 Frequency of use, according to students’ department. In the IC department, 31 percent of students reported using the area more than once a week, compared to 7 percent in the English department and 15 percent in the ILC Department. In the next bracket, 60 percent of IC department students reported using the area once every one or two weeks, compared to 26 percent in the English department and 32 percent in the ILC department. 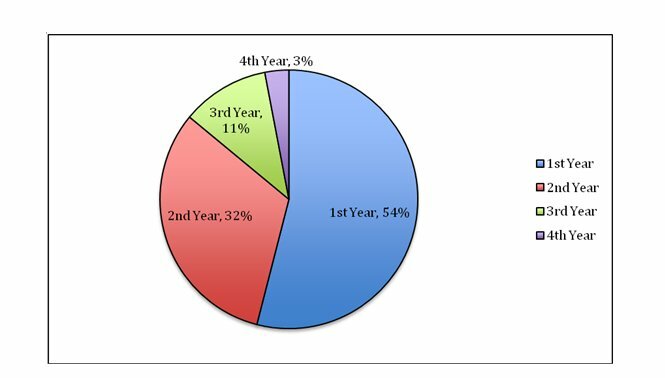 Similarly, while students who used the area less than 5 times throughout the semester represented the majority of students in the English department (67 percent) and the ILC department (53 percent), they made up only 9 percent of students in the IC department. These results are consistent with the log book results which indicated the average IC department student visited the area almost five times as often as the average English department student. The seventh survey item investigated reasons for using the English-only area and is summarized in Figure 5. Figure 5. Motivation for going to the speaking area. 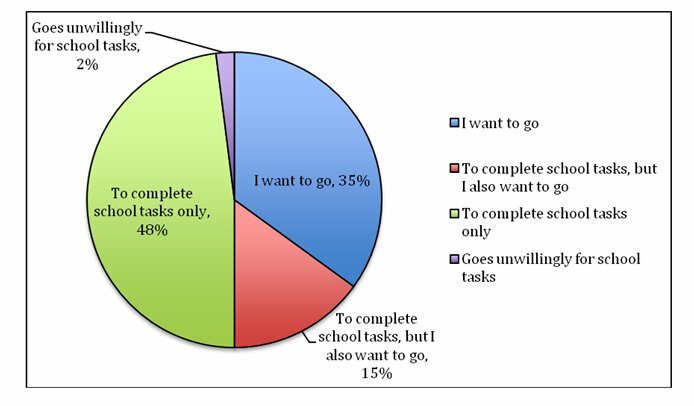 Seventeen percent indicated the completion of course tasks as the primary reason, while two percent indicated an unwillingness to use the area. The vast majority indicated a desire to use the area as the primary reason for visiting. When the results were viewed departmentally, once again differences became apparent. 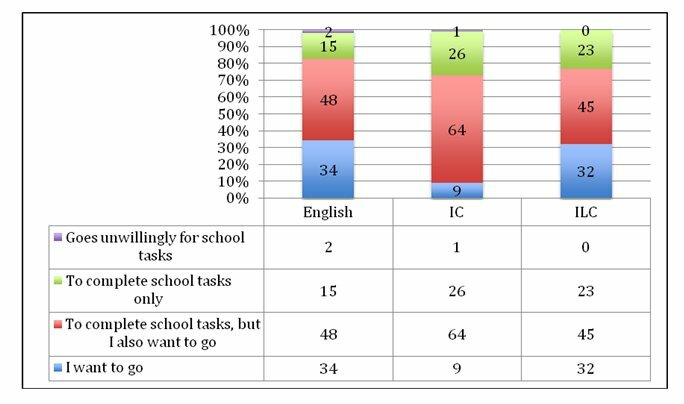 As shown in Figure 6, while the English and ILC departments showed high levels of self-motivation to use the English-only area, with a third of students reporting they used it purely because they wanted to, this accounted for only nine percent in the case of IC students. 90 percent of IC students reported school tasks as a reason for using the area, 26 percent of those indicating course tasks as the sole reason. These results indicate that students of the English and ILC departments use the English-only area for different reasons than students of the IC department. For IC department students, course tasks were the prevalent reason for using the English-only area, although the majority of these students also expressed a willingness to go. Figure 6. Motivation for using the speaking area, according to department. The final survey item investigated student satisfaction regarding the English-only area. Half of the freshman students reported they were unsatisfied (5%) or not very satisfied (46%), this compared with the other half who reported they were satisfied (34%) and very satisfied (15%). These results did not differ greatly across departments. Instructors recognized benefits that the speaking area provided students. Almost all interviewees commented that the area provided students with a less structured and more relaxed interaction than provided in language classrooms. Instructors agreed the area allowed students to practice language use and helped build cultural awareness.Instructors saw a link between early use of the area and continued use. Instructors agreed that once students became regular users, it helped them maintain good habits in using the area. They felt usage patterns of the area are established during students’ freshman year, and that if a student did not use the area in this first year, they were unlikely to use it at all throughout their 4-year degree. Instructors from the IC department gave a regular homework task in the form of a speaking journal to their students, in which they were encouraged (but not required) to use the speaking area for its completion. Such comments from IC department instructors shed light on the different results concerning use of the area by the students in both the logbook and survey data. Instructors mentioned student shyness as an area of frustration. One factor mentioned by nearly all instructors was that some students were very the shy and nervous resulting in apprehension to approach the instructor or excessive quietness once engaged in conversation. Instructors mentioned unrealistic expectations from students as an area of frustration, especially in regard to the expectation that the instructor should be the centre of attention. Nearly all instructors commented that the student expected all conversation to be centred on the instructor and thus took a passive role in initiating and maintaining conversation. Some of the metaphors used by instructors regarding their perceived role in the area included “entertainer” (7 comments), “hub” (3), “focus” (2), and even “zoo animal” (1). Instructors saw topic management as an area of frustration. According to almost all instructors, students did not seem to understand how to approach, initiate, sustain, and conclude a conversation. Students often came unprepared to the area, and did not know how to hit on a topic of mutual interest. In summary, while instructors saw the benefit of students’ use of the area, there were a number of frustrations, which stemmed from what the instructors viewed as inappropriate or misunderstood use of the area by the students. The results indicate that classroom activities had a huge impact on student use of the area. 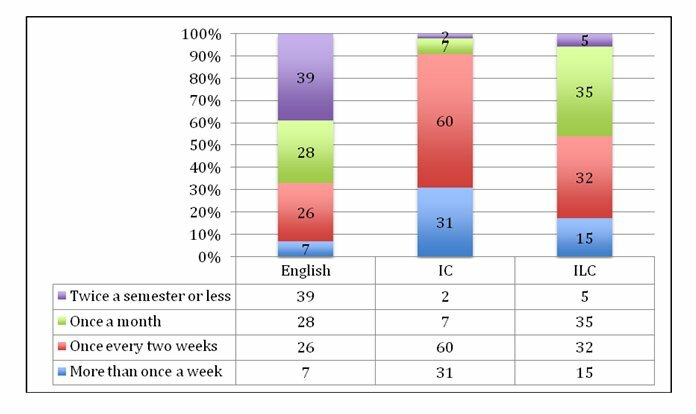 Students of the IC department who were given a structured and frequent speaking journal task, were more inclined to use the English-only speaking area due to having this purpose. This higher degree of use also equated with a higher satisfaction with the area, higher awareness of how to use the area, and higher levels of comfort when in the speaking area. However, a large number of students from this department commented that they used the area solely to complete these tasks (26 percent). To some instructors, this brought into question the self-access nature of using the area to complete the tasks. However, such results indicate the positive benefits these tasks can have in familiarizing students with a self-access speaking area, but also warn against prolonged use of these tasks once these aims have been achieved. These results, therefore, can help inform similar institutions of ways in which they can promote positive usage of their English-only areas. The results suggest materials should be designed to teach the students about instructor expectations of them when using such facilities. Resources could also be made to train students to become more active participants in conversations with the instructors. With regard to instructors, they should feel empowered both in the classroom and in the English-only area to tell students that the primary goal is student-driven conversation, and the instructor serves as more of a participant and guide than initiator. This conflict of roles both in and outside of the classroom also leads to the debate over whether use of instructors is necessary in the speaking area at all. Perhaps the role of native speaker on duty in the area could be more appropriately filled by employees who are not professional academic staff. Employing foreign language exchange students, peers, or English conversation instructors, where this pre-existing student-instructor relationship would cease to be problematic, may prove more fruitful for some institutions. In conclusion, the data collected suggests many areas for positive change that can be made to improve experiences in the English-only area for both instructors and students at the institution. Further research into how to incorporate awareness-raising activities into the freshman curriculum would be beneficial to future positive use of the area. This report suggests the trial of tasks in the curriculum that promote correct usage of the English-only area and to provide scaffolding to enable students to become more active and prepared users of this area. The study also offers suggestions to educational institutions that are considering establishing similar English-only facilities. Firstly, the findings of the study suggest careful thought be made into how students are taught to use the area effectively. Secondly, students should also be made aware of expectations placed on them by instructors in the area so that they are able to leverage a maximum amount of benefit from the area. Thirdly, results show classroom activities that encourage use of the area have a positive effect on both use of the area and attitude toward this use. Finally, institutions should carefully evaluate the rationale behind hiring decisions in terms of who they want to be working in the area and what their role should be. With regard to implications for future study, the authors acknowledge that the data for this study is relatively old, being collected in 2005-2006. For this reason, the institution already may have implemented many of the suggestions offered. Thus, a future study, which reported on the effectiveness of these suggestions, would be of research interest. Furthermore, as this study represents a single case of student use of an English-only facility, the findings would be further strengthened through investigation of similar facilities offered at other language institutions. Heath Rose is an assistant professor at Rikkyo University, Japan. He first became interested in self-directed learning and learner autonomy in 2003 when he completed his masters dissertation in the field of strategic learning. He continued this vein of research in his PhD study in the fields of strategy use, motivation control and self-regulation in language learning. Roxanne Elliott has taught and translated in Italy, Japan and California, where she now resides. Her interest in motivation and autonomy grew as she pursued her MA in TESOL from the Monterey Institute of International Studies in California. As an instructor at Kanda University of International Studies from 2005 to 2007, she developed and implemented self-access learning materials and teacher-led curriculum to encourage learner autonomy. Canale, M. (1983). From communicative competence to communicative language pedagogy. In J. C. Richards & R. W. Schmidt (Eds. ), Language and communication (pp. 2-27). New York: Longman. Cooker, L., & Torpey, M. (2004). From self-direction to self-access: A chronicle of learner-centred curriculum development [Special issue]. The Language Teacher: Perspectives on Self-Access, 28(6), 11-14. Dam, L. (2003). Developing learner autonomy: The teacher’s responsibility. In D. Little, J. Ridley and E. Ushioda (Eds. ), Learner autonomy in the foreign language classroom: Teacher, learner, curriculum and assessment, pp. 126-150. Dublin: Authentik. Morrison, B. (2005). Evaluating language gain in a self-access language learning centre. Language Teaching Research, 9(3): 267-293. Rampton, M. (1990). Displacing the ‘native speaker’: Expertise, affiliation, and inheritance. ELT Journal, 44(2), 97-101. Rose, H. (2007). Jump-starting student motivation to use self-access learning facilities in high-anxiety learning environments. Kanda Journal, 19, 171-188. Savignon, S. J. (1997). Communicative competence theory and practice: Texts and contexts in second language learning (2nd ed.). New York: McGraw-Hill Companies. Spratt, M., Humphreys, G., & Chan, V. (2002). Autonomy and motivation: Which comes ﬁrst? Language Teaching Research, 6(3), 245-266. Sturtridge, G. (1997). Teaching and language learning in self-access centres: Changing roles. In P. Benson & P. Voller (Eds. ), Autonomy and independence in language learning (pp. 66-79). London: Longman. Although the authors prefer the term “proficient user” as defined by Rampton (1990), the term native-speaker is used in this paper due to its widespread use in the literature. English was the native language of 37 of the 42 instructors. The remaining 5 instructors were proficient users of English, whose first language was a language other than English.